This Bible belonged to, and was presumably made for, Robert de Bello (i.e. 'of Battle', near Hastings), who was abbot of the Benedictine abbey of St. Augustine, Canterbury, from 1224-53. He was clearly concerned to have an accurate text--it has been corrected carefully throughout--and his influence may be responsible for some of the very unusual imagery included among the initials. 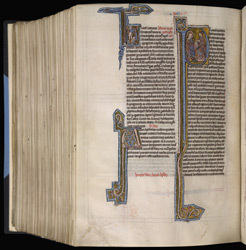 The large initial 'P' apparently shows St. Luke writing the Acts of the Apostles, with Theophilus, to whom the Acts are addressed in the opening lines. To a modern audience it may seem strange to find images such as that in the top left initial in a religious book such as this Bible.